Keeping Up With The Joneses: Let's Skate And Then Dance! Let's Skate And Then Dance! The day Jordyn had been patiently waiting for finally arrived; her 11th birthday party. This year we had a skating party at Hot Wheels! We had to plan it for a Friday night because of our crazy soccer schedule, which turned out to be a great time to go skating since it wasn't crowded. We had an absolute blast and even better than no one broke anything! The pictures aren't the best due to the lighting, but they are good enough. This picture cracks me up. Katie posing as usual plus the fact she is using a skate-mate and then Joey's face because he is laughing at his lovely wife. Don't worry Katie, Bryan's a non-skater too and we love y'all still. 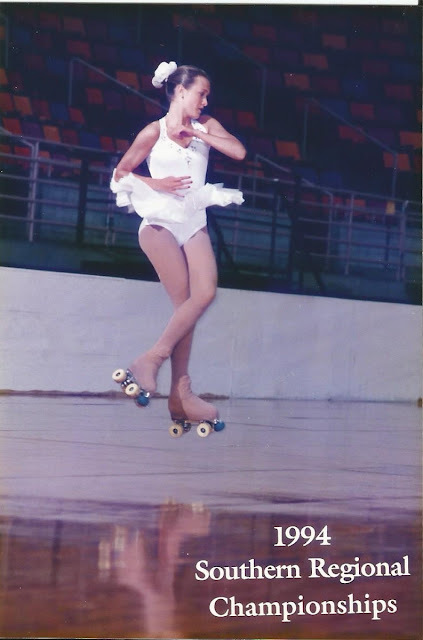 And just because it's fun here are 2 throwback photos from my skating days. Artistic skating - "freestyle" (jumps, spins and pretty dresses). Inline racing - similar to short track ice speed skating. Skin suits, floor burns and obviously tough faces. The next day we were at the fields from 9:30 to 4:00. It was so cold and windy I didn't take many photos so I'll spare you more soccer pictures. After 3 soccer games it was time to book it home and get Sydney ready for her Homecoming Dance! These are Sydney's best friends and they are a lovely bunch. Victoria was MIA in this shot because she was taking photos with her date! Clearly the apple didn't fall far from the tree. I love this girl.